I am not trying to preach or teach anything. I am as imperfect as anybody. Only difference is, I have learnt to embrace the shortcomings (and I am still learning). I do like to believe that it has helped me. And that’s my motivation for writing this! For my fellow Seekers. For my fellow Dreamers! This one draws similarity between what I studied in my Chemical Engineering course and what we generally go through in life. A chemical reaction is a process when two or more substances combine or break away to reach a state which is more stable. Red diagram shows what a chemical reaction’s path looks like. 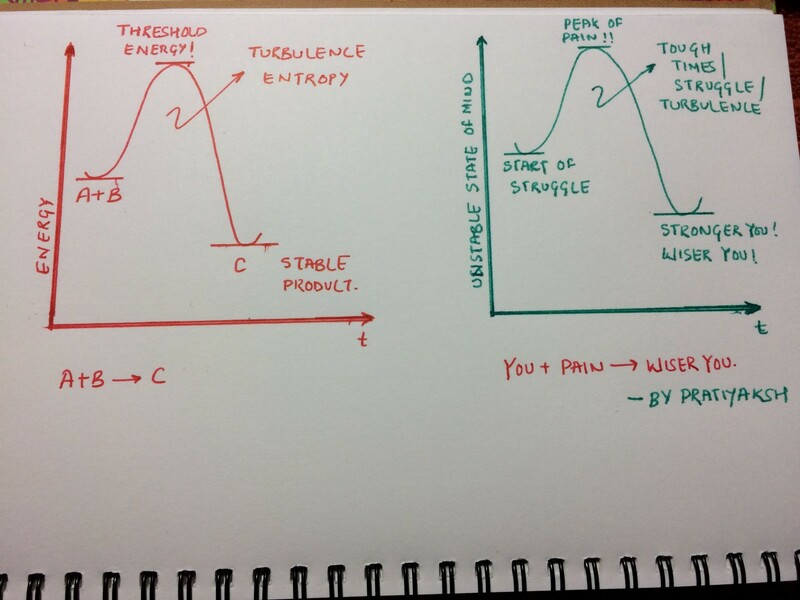 It wants to reach to the product C which is more stable, less on energy or turbulence. But it is not that simple. In order to reach C, it is supposed to cross a threshold energy level. Only when it crosses that point, it would convert to C. Crossing that energy level means a hell lot of turbulence than its present state. And once it crosses that, it loses its own identity and becomes a superior self of itself. Now think about the struggle you are going through in your life right now or have gone recently. Please don’t say that you are not. We are wired for struggle and that is our basic nature. Your struggle is no different from a chemical reaction someone is trying to carry out in a laboratory. Struggle comes with a lot of turbulence and unstability in life. We all know that…right? It seems like nothing is going our way or right way. Then a point comes when we feel like this is just enough. Few also decide to take extreme steps. If you’d go back and closely look at any of your pre struggle and post struggle days, you’d always find that there is a pattern all across. You did nothing but stayed there, waited to cross that threshold point i.e. the peak of pain, unstability or anything and then you came out wiser and stronger. So, if nothing is going your way, you just need to hang in there and wait for the threshold to cross. Because, that is how the nature has been designed. Struggle, Pain, Turbulence, Learning…lead to Wisdom. Now it’s upto you what you want to do with the wisdom you acquired or will acquire by paying the price of tears, sweat, anger, frustration and what not. Because that is what life is all about…right? Gaining wisdom! Learning and Unlearning and making every moment count. PS : I have learnt this after getting rejected, getting my heart broken, failing umpteen number of times in different avenues, phases of my life.